Creative playzone! A "living" sandbox game. Mouth recorded Sounds! The others are placeholders, not otherwise! Colors! Yes many of them, called "binary LSD"
Fresh stuff! Because it was created for Beams! Fun! I had some while doing, others will have some while playing Beams, that´s fair. Prepering Demo Level for closed alpha. Closed Alpha means in my/Beams case, that my composer and some tubers get the Demo first. After some tests /min/spec*performance ( and updating with polished content), i will release the Domo for free and start then Greenlight process. Demo will be free in any case and contains one playable Track with competition functionality *fingers crossed*, but perhaps i could include more free stuff for the Demo later. 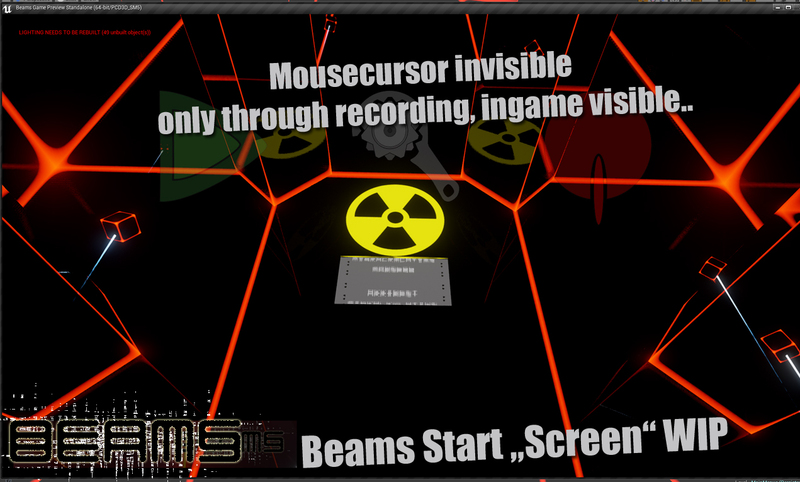 Here you can see, how the Startscreen/Main Menue will look in Beams, yes it's some sort of interactive. Mouselook activated, other functions/movement locked. Tell me, what you think. Here some more devsnippets from the working Demolevel. Here a Video about devprocess of destroying stuff and feeling like Dualzan! Do you need someone to give you his thoughts, reporting bugs and giving tips? Not to far away i could use some testers, yes. But i have to talk with other more experienced devs(then me), which step comes first. I do not want to crash my little project, because it makes me happy. Do you like the inventory idea? I will send you an Pm tomorrow! About the inventory, i like it! Maybe let people Search for an item to open something? Yes, search for the battery, search for the pullerunit, then the inventory, when i understand you right? No i mean you Search (in this case) a battery, to put it into a machine so you can control it. But you can't put the battery everywhere so a kind of puzzle which item needs which machine. Yes different types of batterys for different tasks would be nice to complicate stuff! Awesome videos, will you get us some downloads to try? @etsvigun. Thank you so much. Feels so nice that more and more ppl seem to like the concept of Beams(yes it has one). I plan to finish a playable Demo whith a basic "track" first, to gain somefeedback and suggestions perhaps. Then players will easy get rid of mechanics and understand that concept and i hope they will like it. No Book needed to play it, but skill in timing and logical thinking - routeplanning - learning patterns of ingamemechanics. Launch will be on steam (could be here too). but i put not all stuff i still have into, some only as decoration. Someone asked me about the PRICING for my game and i am not sure about that. I bought so many bad games in the past(good ones too) and for the bad ones i paid around 40€ each! With beams i have ten times more fun, like with one of the many bad games i bought. I think 400€ would be a bit to greedy, but 250€ for full product should be fair or not? Reminds me a lot of tron, love the style keep it up. It looks in some way cold, but not too empty.